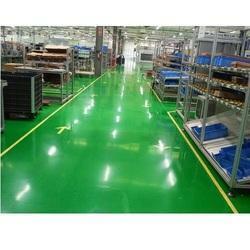 We are the leading service provider of Anti Static Epoxy Flooring Service. Through surface, preparation is a must for best results i.e. surface preparation is the key to the durability of coatings. It should be ensured that the surface on which the primer is going to be applied is rough in nature. The concrete must be made clean, dry and free of any oil, grease or other bond breaking contamination. CDS (Clean, Dry, and Sound) test is to be conducted on the concrete. It is also of prime importance that the substrate shall not suffer from rising dampness of moisture content more than 5%. A moisture test is conducted by a moisture meter or plastic sheet method (ASTM D4263: a Standard test method for indicating moisture in concrete). Surface preparation likes grinding etc is done to achieve a surface profile of 150-200 microns. The groove is cut manually and cleaned properly for removal of dust. The cleaned grooves are filled in with our filling material. The primer coat is a thin mild coating which penetrates into the concrete and forms and cohesive bond. The primer provides excellent adhesion to the concrete / cementitious substrates. 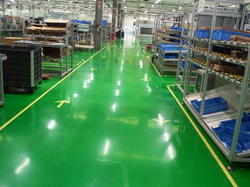 Epoxy based primer is applied to the prepared surface, which is solventless, low viscous, two component epoxy. EPU screed consists of 3 parts i.e. resin, hardener and the aggregates, which gives maximum strength and protection to the coatings. Epoxy: Epoxy self-leveling flooring is a four-component self-leveling system based on pure liquid epoxy resin cured with a special grade of cyclo-aliphatic amine. PU: PU is an aromatic based roll-on with a coating, which has excellent abrasion resistance. EPU: EPU is hybrid chemistry of epoxy and urethane. Through surface preparation is a must for best results i.e. surface preparation is the key to the durability of coatings. It should be ensured that the surface on which the primer is going to be applied is rough in nature. The concrete must be made clean, dry and free of any oil, grease or other bond breaking contamination. CDS (Clean, Dry and Sound) test is to be conducted on the concrete. It is also of prime importance that the substrate shall not suffer from rising dampness of moisture content more than 5%. Moisture test is conducted by moisture meter or plastic sheet method (ASTM D4263 Standard test method for indicating moisture in concrete). Surface preparation likes grinding etc is done to achieve a surface profile of 150-200 microns. Epoxy Epoxy self-leveling flooring is a four-component self-leveling system based on pure liquid epoxy resin cured with a special grade of cyclo-aliphatic amine. PU PU is an aromatic based roll-on with a coating, which has excellent abrasion resistance. EPU EPU is a hybrid chemistry of epoxy and urethane.